What is the purpose of a P handle sack truck? When moving heavy loads for short distances, it is recommended that the right type of equipment be used for the purpose. This product can handle weights of up to 200kgs, and is made with a steel concave frame for durability and strength. To provide enhanced convenience, a p-shaped handle is provided, which makes it convenient to operate with one hand when lighter loads are being shifted. The pneumatic tyres offer superior cushioning, so this sack truck can be used to move fragile goods with no fear of ground impact damaging them – as long as they are used on relatively plain surfaces. 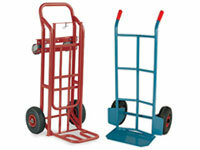 Sack trucks may also be referred to as a sack barrow, hand truck, or a sack cart. Where can a P handle sack truck be used? This product is ideal for warehouses, storage facilities, libraries, schools, offices, government buildings and several other locations. The red coating makes them highly visible and gives them an attractive yet serious look. 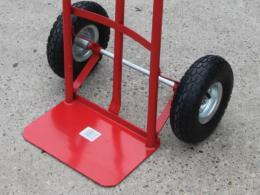 Wherever loads of up to 200kgs need to be shifted at a moment’s notice, this product will save the day. For regular users, it is an absolute necessity. The versatile design makes it easy to stow when not used, and convenient to pull out and deploy when needed. Any facility or business that regularly requires heavy parcels, cartons or packages to be moved short distances will find this an invaluable addition to their equipment inventory. This product can be used by anyone who wants to shift heavy loads easily and safely. The P handle allows for single-handed operation when the load is relatively light, and the regular handle is perfect for heavier loads. 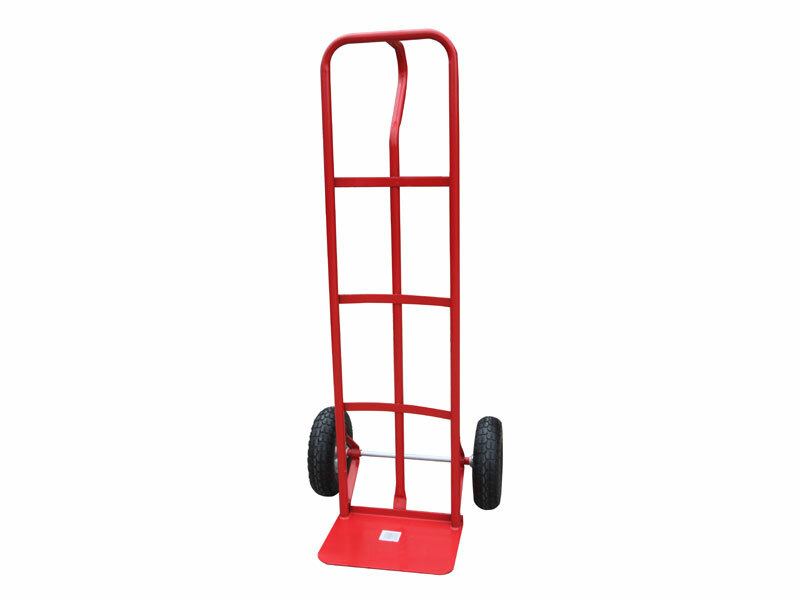 It is very useful for warehouse employees who continually move heavy loads about from the loading bay to the storage area. It is also convenient for dispatch staff who ship out items through the day. The hospitality industry regularly handles dozens, if not hundreds, of beverage and food cases, and personnel responsible for moving these items from the stock room to various parts of the facility will find this a most useful product. 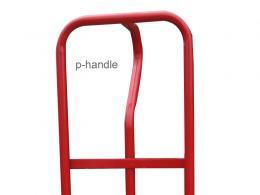 The P handle sack truck is available in red, and the frame is constructed from high-quality steel. The product’s dimensions are 1310 (H) X 540 (W) X 475 (D), and the footplate’s dimensions are 350 (W) X 220 (D). 260mm pneumatic tyres provide superior cushioning, and the sack truck can handle a maximum load of 200kgs. The Workplace Depot offers a standard one-year warranty on all parts and labour. Our P handle sack trucks fully comply with all local council and government regulative manufacturing requirements to ensure the safety of your customers and staff.